He left the rest of the design choices up to me. Of course, I decided to use his personal design -- the faux bois and baby blue that he uses in his business card/brand identity for Cole Stipovich Design. 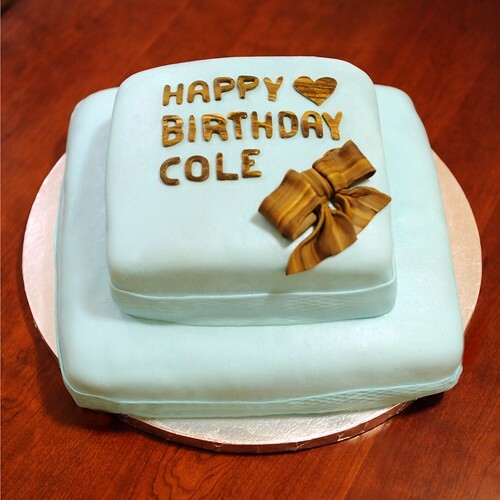 Since the cake was his birthday present, I tried to make it look like one with my first attempt at a Fondant Bow. I tried following these instructions, but I only had about 15 minutes to get it done and I was using fondant, which doesn't hold it's shape like gum paste, so there is certainly room for improvement. 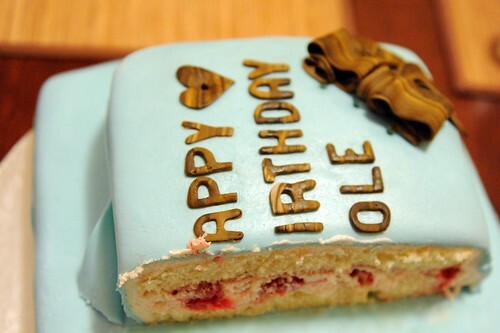 We brought the cake to Cole's Birthday Dinner at Nanu and Chief's [new] place. Check out Nanu's pretty real bois table. Faux. Bois. That's just fun to say. Oscar drew pictures of cake. He also sang Happy Birthday in Italian. 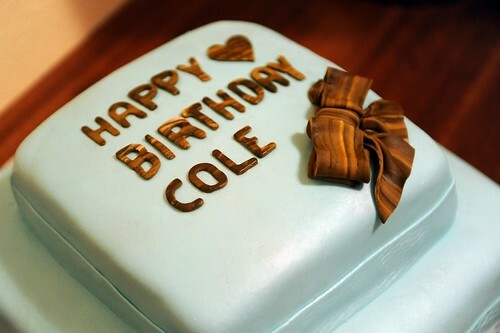 He brought his A-game to Cole's Birthday Party. Since Oscar was singing in Italian, we all chipped in with our language of choice. It was quite the choir. I don't know exactly what is going on in this picture, but I like it. 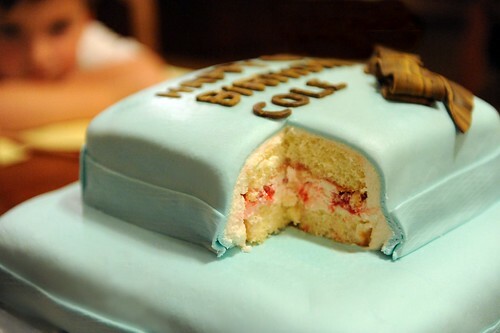 The inside of the cake: Whipped Cream and Fresh Raspberries sandwiched between a Lemony Chiffon Cake. 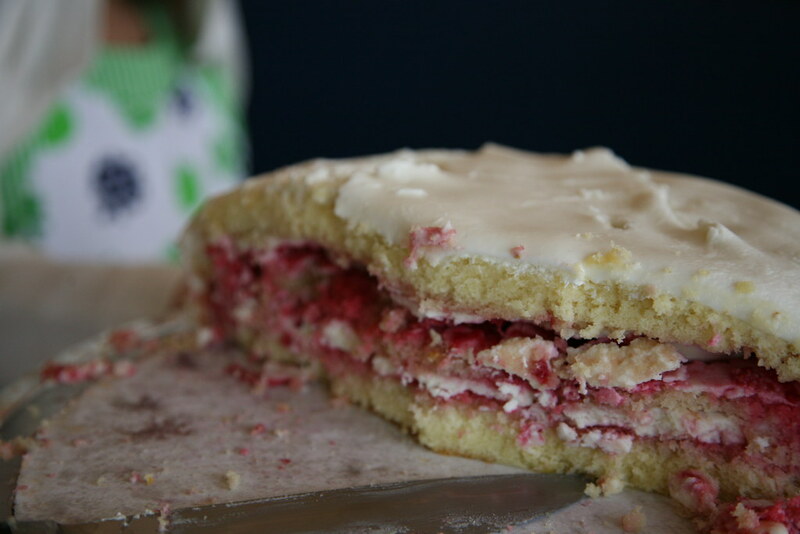 On the inner layers of the cake there is a thin coating of white chocolate on the bottom layer and a raspberry-lemon curd spread on the upper layer. 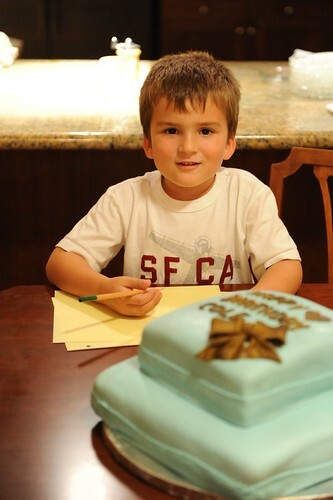 Then the whole cake is covered in white icing and marshmallow fondant. 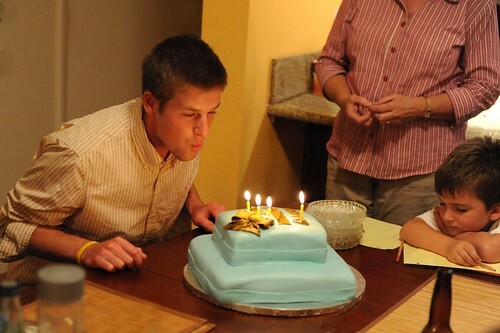 It was sugar coma for all of us after a big ol' rib dinner, but I swear I think this cake got better the next day. 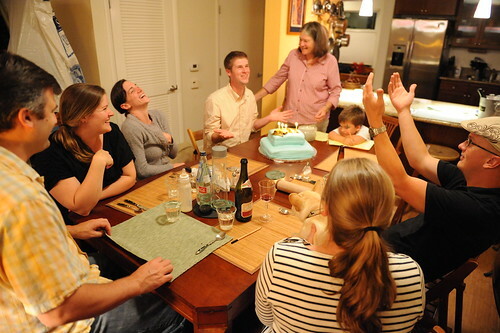 Which was good, because we had enough left over that everyone got to go home with a big old chunk of cake.